S. H. Horn describes the biblical significance of Heshbon. A city of Transjordan strategically located at the main north-south road, called the King’s Highway in the Bible, some 15 mi. (c. 24 km.) southwest of “Amman (Palestine Under Joshua and the Judges). The Israelites captured it from Sihon, an Amorite king, who had taken it from the Moabites and made it his capital (Num 21:25–30). The city was given to the Reubenites and rebuilt by them (Num 21:34; 32:37; Jos 13:17). However, since it lay on the border between Reuben and Gad, the latter tribe seems eventually to have occupied it (Jos 13:26). It was later assigned, as a town of Gad, to the Levites (Jos 21:39; 1 Chr 6:81). The Moabites reconquered the city in the period of the divided kingdom and occupied it in the time of Isaiah and Jeremiah (Is 15:4; 16:8, 9; Jer 48:2, 33, 34). However, during Jeremiah’s lifetime it seems to have changed hands again, since he refers to it as an Ammonite city in one of his later oracles (Jer 49:2, 3). The Ammonites seem to have taken it during an invasion of the Moabite territory referred to in Ezekiel (ch 25:9, 10). It was in the possession of Alexander Jannaeus in the time of the Maccabees, and was later ruled by Herod the Great (Jos. Ant. xiii. 15. 4; xv. 8. 5), who fortified it and made it into a garrison city called Esbus. Later it became a Christian city and seat of a bishop. Several bishops of Heshbon are known by name. In 614 the city suffered greatly during the Persian invasion, when its 3 churches—so far excavated—were destroyed. The Arabs who some 20 years later occupied the country made the city, then called Ḥesbân, the capital of the district. After the 13th cent. the city is never mentioned again. Excavations were conducted at Tell Ḥesbân under the direction of Siegfried Horn and Larry Gerarty from 1968 to 1976. A large open-air reservoir dating to the Iron Age, the period of the Israelite kings was uncovered. The pool measured about 50 ft. x 50 ft., and was 18 ft. deep. It was large enough to hold 300,000 gallons of water. The Iron Age Plastered Reservoir at Heshbon. View West. Photo by Ferrell Jenkins. I have followed the information by S. H. Horn in The Seventh-day Adventist Bible Dictionary. In a post to come I hope to explain why Tell Ḥesbân may not be biblical Heshbon. 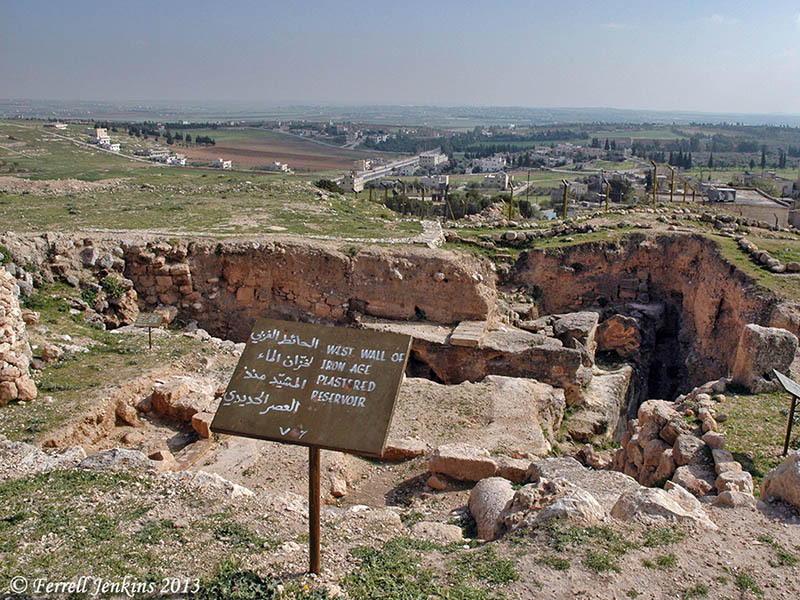 This entry was posted in Archaeology, Bible Lands, Bible Places, Bible Study, Jordan, Old Testament, Photography, Travel and tagged Heshbon. Bookmark the permalink. Looking forward to the post to come.